Resources and links to people and organizations related to the official Robert Johnson Blues Foundation website, and to the music of the legendary Robert Johnson, whether it is through art and artists, music and musicians, or simply the appreciation of all of the above. BluesFolkArt.com – Chris Kruse, blues folk artist. 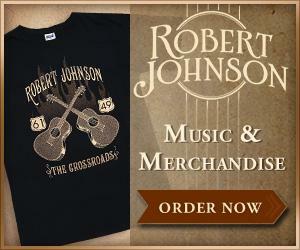 Robert Johnson is the source of his inspiration. Patrick Droney – 2006 Gibson/New Generation Award Winner. Hear Patrick’s music samples, chat, etc. Bob Long – British blues singer, guitarist and harmonica player specializing in “the old stuff” particularly music from the Mississippi Delta.